Science in the Beginning is the first book in a hands-on, multilevel elementary science series that introduces scientific concepts using history as its guide. The beginning of history is given in the Bible's creation account, and this book uses the days of creation as a way of introducing a wide range of scientific concepts including the nature of light, energy conservation, the properties of air and water, introductory botany, our solar system, basic zoology, and some aspects of human anatomy and physiology. As the students learn about the scientific concepts, they are constantly reminded of the Creator who fashioned the marvels they are studying. Because of its unique design, the course can be used by all elementary-age students. Each lesson contains an interesting hands-on activity that helps to illustrate the scientific concept that is being discussed, and it concludes with three different levels of review exercises. Students do whatever review exercise matches their specific level of understanding. 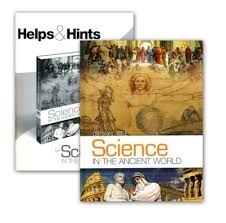 Everything the parent/teacher needs to know is contained in the accompanying "Helps and Hints" book.